Improved Performance - Faster Times! Drawing on decades of elite level experience Swim Swift Elite has the capacity to improve your techniques and skills whatever your age, ability, event, or discipline. Their passion, knowledge and expertise will enhance your performance in an inspirational atmosphere. Be your best, learn from the best. Let Olympians Joe Roebuck and Amy Smith help you on your way to the top. We will use the latest innovative training techniques to improve your skills and confidence during competition. Enjoy a visit during your usual club sessions from two Olympians determined to inspire the next generation of competitive swimmers. A choice of pool, classroom or land training tailored to suit your clubs needs. Swim Swift Elite Swimming Camps offer an affordable group training experience which will help you improve in so many areas of your performance. Spend two amazing days with two Olympians, get twice the Olympic experience. “Thank you Joe and Amy for an excellent weekend of swimming for Max. He really enjoyed the two day camp and felt he got a lot of helpful pointers for both his freestyle and butterfly. Having you both give demonstrations in the water was really helpful and a highlight for Max. He told us “I swam in the same lane as an Olympian!”. “Wow so much packed into two days – amazing!Just to say an enormous thank you for all of your guidance and support given to the boys at the weekend.They had a great time and you truly inspired them. They took on board so much that you had spoken about and demonstrated. It was great to watch my son swim at training this evening and put into action some of the tips that you gave.A super dive into the water followed by power on and off were being put to good use in his fly and turns were looking sharp. To name just a few things.Looking forward to watching my son put into action the tips given especially for his 1500m free at the weekend. He really got lots from the training and is going to work really hard on his dive, kick and fly. His father and I are looking forward to watching them further and see how they use the skills to improve their swimming. With Counties coming up they have the motivation. Let’s hope they are able to achieve the goals that they have set themselves. The training was action packed and encompassed many aspects of swimming both in and out of the pool. Your communication to parents and swimmers was very good and delivered really well in a very friendly manner.The venue was super and the staff were very helpful. Well done. You are both world class athletes and lovely people too. Many thanks. Hope to see you again. We are Olympians Amy Smith and Joe Roebuck a pair who have created Swim Swift Elite. Together we offer a variety of ways to improve your swim skills and offer our services to individuals and groups of competitive club swimmers striving for county level and beyond to maximise your speed and performance in the pool. We hold affordable UK swim camps at various venues around the UK & Europe. Many camps are organised for the school holidays throughout the year. It's your chance to experience a top-class Swim Camp with the in-depth coaching to help you perfect your stroke techniques, improve your starts & turns, work on your race tactics and more. 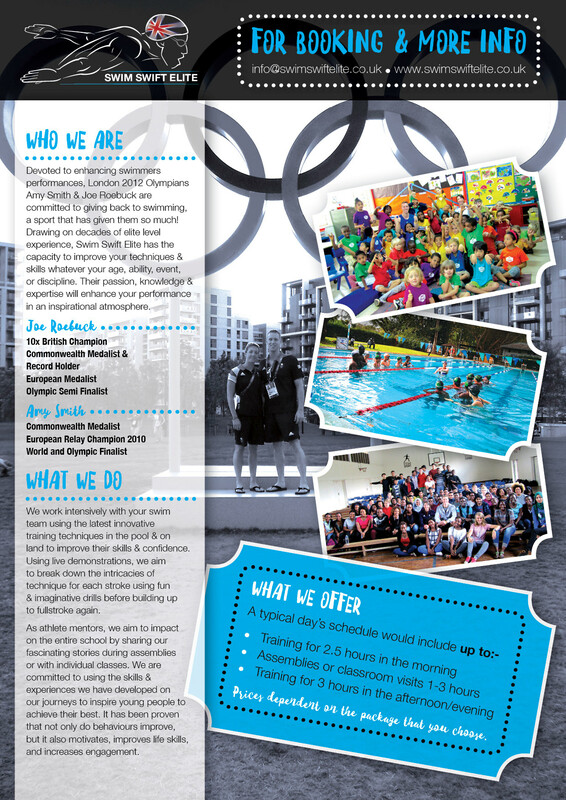 You can book our Swimming Masterclasses, Triathlon Swim Masterclasses or Personal Appearances in most parts of the UK - Mention us to your club. We are also now planning our Swim Camps for the next 12 months so keep an eye out for our latest news and the locations for our next swim camps in your region.